Anyone searching for Robin Hood can draw on a wide range of literature from the tomes of weighty academic research to the rather more inventive reworking of the legend in modern fiction. Often missing is the sense of spirit, time and place which gives the reader personal access to Robin`s world; a world very different from the one we live in today. 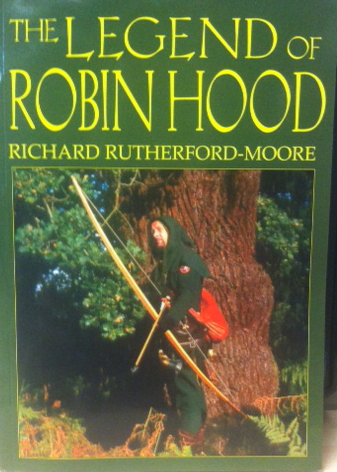 And that`s precisely why Richard Rutherford-Moore`s book, "The Legend of Robin Hood" works so well. To begin with, Rutherford-Moore knows his subject intimately. An accomplished historical interpreter born only 1/4 of a mile from Loxley (a claimed birthplace of Robin Hood), the author is renowned in Nottinghamshire for his guided tours of Robin Hood country in the guise of a Forester of Sherwood AD 1200. He knows of Robin Hood and of life in the Greenwood and he tells it both like it was and like it is with authenticity and authority. In "the Legend of Robin Hood" the topic is explored from the early beginnings of medieval times through to modern 20th. Century cinema and fiction. The book begins with the dawn of the Robin Hood Legend guiding the reader through the heady historical mix of myth, beliefs, traditions and culture which set the stage for Robin`s exploits.